I was doing a quick backup of my most recent travel photos from Bali and I came across this photo. 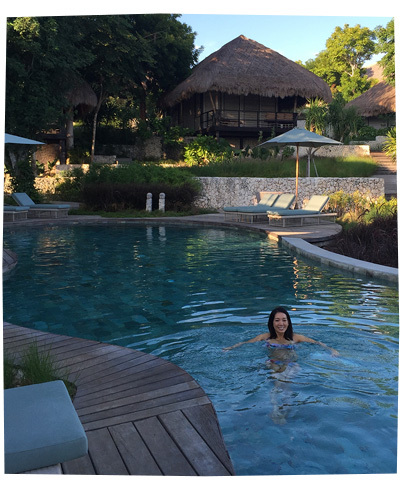 I was with my mum, staying at a fancy, eco-sustainable clifftop resort — and due to a broken air-conditioner, we were upgraded to a luxurious private villa with its own infinity pool. I was pinching myself. I don’t think I’ve ever stayed in a place this luxurious. I was sooo excited by the bathroom sink! The hand woven rugs! The floor boards! I definitely was not accustomed to it all. My mum and I woke up at 7am. We had a jam-packed day, but we still were keen to make the most of our day. We decided to have a spontaneous dip in the pool. I was so relaxed and happy in the water, and I think my mum perfectly captured my goofy smile. I was truly loving the moment. No rush. No angst. No stress. No wandering mind, stirring up internal conflicts. No reevaluation of my life choices up to this point. No delusions about how my life could be like this forever. Just me in the water!